The full "supermoon" of Dec. 3, 2017, rises against a pink layer in Earth's atmosphere known as the "Belt of Venus" in this photo captured by astrophotographer Miguel Claro near the village of Monsaraz in Portual's Dark Sky Alqueva Reserve. Miguel Claro is a Lisbon, Portugal-based professional photographer, author and science communicator who creates spectacular images of the night sky. As a European Southern Observatory photo ambassador, a member of the international astrophotography project The World At Night and the official astrophotographer of the Dark Sky Alqueva Reserve, he specializes in astronomical "skyscapes" that connect Earth and the night sky. Join him here as he takes us through his photograph "Super Full Cold Moon Rising Above Lake Alqueva in Monsaraz." 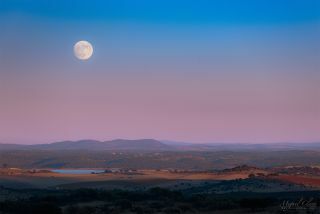 A nearly full "supermoon" rises above a pink band in the sky known as the "Belt of Venus" in this photo captured above Lake Alqueva in the Portuguese village of Monsaraz. A flock of birds flies in front of the "Belt of Venus" over the village of Monsaraz in Portual's Dark Sky Alqueva Reserve in this photo captured by astrophotographer Miguel Claro. Also known as the anti-twilight arch, this phenomenon is visible shortly after sunset above the eastern horizon. It is caused by reddened sunlight scattering off of particles in the upper atmosphere, a process known as Rayleigh scattering. The reddened rays combine with blue and violet light to give the rosy pink band. Supermoons happen when the moon becomes full around the same time that it reaches perigee, or a point in its orbit at which it is closest to Earth. This makes the moon appear slightly larger and brighter than usual.